Our exposé, published in February 2014, reveals the export of Dartmoor Hill Ponies from Britain to Ireland and Europe. It also exposes the lack of welfare in transport, a loophole in the minimum value legislation, and the failure of the authorities to police the rules and regulations designed to protect the wild ponies of Britain (last updated 28/02/14). When we started attending the SW wild pony markets in 2010, we became aware of an issue surrounding the ponies that people4ponies had never really encountered before. Although there might be some private buyers buying one or two foals, there were individuals at the sales mass buying ponies. They were buying as many ponies as they could fit into their lorry…or they’d hire the services of a small lorry and take 3 or 4 shipments of ponies away to another location. At some markets there have been lorries bigger than anything we’ve seen before. At one Bodmin pony market there were 2 of these “super” lorries signwritten with “International Haulage, Ireland—UK– Europe”. 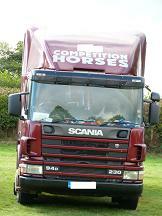 They carried approximately 40 ponies per lorry. At the markets dealers fill their lorries to capacity…or more. It is now no secret – ponies were being transported abroad to Ireland and Europe. All ponies, whether registered (“pure-bred” ponies) or unregistered (ponies such as Dartmoor Hill ponies with no pedigree), are supposed to be legally protected under the Minimum Value Legislation to prevent them from being exported from Britain to Ireland or Europe for slaughter. For any pony under 14.2 hands high to be transported to Ireland or Europe they must have documentation, which includes proof of their value of £300 for a pony between 12-14.2hh, £220 for a pony up to 12hh and £145 for Shetlands up to 10.2hh. An export license is required, and a fitness to travel or health certificate signed by a vet has to be included. If unregistered ponies are being travelled to Europe then a Journey Log is also required which includes details of the transit, stopping areas so that legal journey times are not exceeded, and a vet is supposed to check the animals on departure and on arrival - but any pony being travelled has to meet the minimum value requirements. The transportation abroad has been openly admitted. On the subject of falling market sales on Dartmoor, a market auctioneer told “The Guardian” newspaper “...But the "killer blow”...was the introduction of the EU welfare in transport regulation which, since 2009, has demanded that horses must be transported in single partitions on journeys longer than eight hours, or on ferries. "This has destroyed our trade to Ireland completely," he says. "Dartmoor ponies are herd animals. They hate to be split up. It is cruel to isolate them like this. But it has also made the cost of transporting them totally uneconomic “. Another individual in the same article makes reference to long road journeys into Europe where there is a market for the ponies’ meat and skins. We have seen for ourselves dealers at markets openly admitting that they are heading straight into Spain with their lorry load of purchased ponies (bought at an average cost of £10 a head + market fees and passporting) because there are no checks. We have also had reported to us lorries of known dealers carrying lots of small “Dartmoor-like” ponies to the Welsh ports just after the wild pony markets here in the SW. This signwritten “Competition Horses” lorry looks convincing from the front, especially with the rosettes in the cab, but the side view shows that it is a livestock lorry. Not many competition horse owners transport their horses in this way. The dealer tended to buy adult ponies and openly admitted he was heading to Spain. It is possible that ponies were being sold straight off the farms and not just through markets – it’s quite common to come across people on Dartmoor who have seen and heard livestock lorries moving animals at “2am” or in the very early hours of the morning. 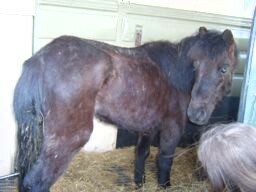 In 2010, the Equine Rescue France charity released photo and video footage of 30 Dartmoor Hill ponies being offloaded at a market at Maurs, France – an important trading market on the horse meat transport route from Spain to Italy. The ponies were described as being “dead on their feet”. “Most had eye infections, a couple were very lame, and all had given up. It looked as if they hadn’t been off the lorry for a long time. Once again, no respect was given to these animals as they were handled, to the dealer they were simply a few euros on legs “. Although they were described as being skin and bone, an Italian dealer bought them and the charity believed their coat markings would hold value in Italy where they specialise in coat and skin production. Late in the summer of 2013 we heard about a pony residing at the Sathya Sai Sanctuary Trust in Ireland that had been rescued at a market. Jetsie – a pony with ear notches and hot brand markings can be traced back to Dartmoor – a Hill pony. Her markings identify the moorland owner - so we know she would have resided on the South West area of the moor, most likely around the Shaugh Prior area. She may have been sold either through a market or directly off the farm. 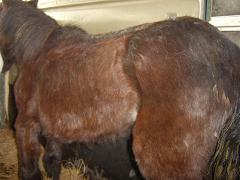 She turned up at a market in Ireland in emaciated condition, extremely frightened and with no passport or paperwork. She had managed to get into a shipment of foals but once at the market the dealers tried to hide her in a back pen where nobody would notice her. Jetsie was confiscated at the market due to the efforts of the sanctuary. She has been rehabilitated and cared for by the charity and they can now tell her story and that of the other ponies they have found. Sue who runs the sanctuary says that until 3 years ago the wild ponies were coming over literally by the lorry load - usually through the North of Ireland in overloaded lorries. 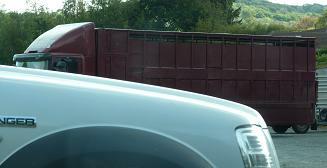 The work the charities there did looking at registration plates of lorries coming over the border from Northern Ireland found many lorries transporting ponies with fake registrations. At just one of the markets that the charity regularly attended there would be upwards of 100 mixed wild ponies at any one sale. The ponies were often tired and poor and many suffered with strangles. Sue says that now numbers have diminished to almost nothing as the Irish Department of Agriculture will not allow animals to be sold at markets and fairs without being microchipped and passported. For years the checks were not properly in place so that “waving a book of the right colour was sufficient to get by”. Dealers would carry boxes full of passports - forged or just acquired from other animals that were moved on or had died. A Dartmoor Hill pony is usually sold for an average of £10 at the Dartmoor markets. The miminum value legislation requires value to be proved by a receipt of sale, insurance certificate, an invitation to compete or a certificate of valuation. Whilst our evidence suggests some cases where the rules and regulations have not been adhered to or enforced, in other cases it exposes a weakness exploited in the minimum value legislation. If you wanted to legally take a Hill Pony to Europe out of a Southern UK Port you'd need an export license, minimum value certificate, a health certificate signed by a vet, a journey log, and of course an equine passport. If you wanted to legally take a wild pony to Southern Ireland (out of a Welsh port, for instance) you would have to apply for an export license with associated proof of minimum value and provide a fitness to travel document signed by a vet, and you'd need a equine passport....BUT...There is also a loophole in the Minimum Value Legislation which has been exploited as a way to export wild ponies out of the UK. By travelling wild ponies straight out of a northern port to Northern Ireland, you can legally export the low value ponies (which would have been denied export licenses from a Welsh port) to Southern Ireland with no minimum value paperwork, export licenses or health paperwork at all. Even though Northern Ireland is part of the UK it does not have Minimum Value Legislation. Of course, transport regulations and equine identification rules do still apply. From here the ponies could even be transported onto France - as Northern and Southern Ireland allow free movement under the Tripartite Agreement. The interesting thing is that when we have spoken to the authorities in the UK, Northern Ireland and Southern Ireland and pointed out that the Tripartite Agreement doesn't apply to horses going for slaughter...the response from all 3 individual countries has been that no horses have been exported for slaughter because none of the health certificates have been applied for! The Tripartite agreement was originally set up to allow the free movement of racehorses and competition horses. It seems likely that many wild ponies (hundreds, if not thousands over the years) have been let down by the minimum value legislation - either from lack of enforcement or from a huge loophole which has been expoited by dealers. It seems some have been travelled illegally and the evidence suggests failures in regard to their health and welfare. It’s now time that Defra admitted not only that this has been happening but also that there are weaknesses in the law. Is part of the problem that the ports haven’t been permanently staffed? The markets were not always attended by local authority staff. At Tavistock market in 2012, we saw a local enforcement officer attempt to get a driver to offload ponies from his overloaded truck but he swore at the officer and drove off - he would not listen to her. The officer said that she suspected that the lorry would be on a ferry that evening but there was nothing she could do. Although Defra are obviously the body responsible for this law, it seems that the ferry companies potentially may also have questions to answer about this. According to AHVLA (a department of Defra) “It is unlawful for the master of any vessel or the pilot of any aircraft to allow the shipment of any horse or pony unless the appropriate documents are delivered to him or to his representative at the time of shipment”. During our investigations we heard from several strong sources that the EU had been providing subsidies for horse meat but we have not been able to find this information in the public domain. We couldn’t figure out how these dealers could be making enough money to profit from these ponies - particularly considering the transport costs...and then early in 2013, the horse meat scandal broke. Autumn 2013 was the first time that none of these dealers were present at any of the South-West England wild pony markets (that’s why sales were so low)! Why have they suddenly stopped? If any of these dealers were transporting to British equine abbatoirs (there’s one in Taunton, about 55 miles away) why did none of them come this year - nothing has changed in that regard in terms of law?? Is the absence of the dealers down to exposure of the horsemeat scandal or clamping down after this?? The port authorities in Northern Ireland say that they haven't seen any lorries travelling wild ponies from the UK since the horse meat scandal was exposed. We haven't seen any dealers buying at markets and the ponies are no longer turning up in Southern Ireland either...so for the moment the trade has stopped. The question is...how closely were our wild ponies tied into the horse meat scandal story? ?...Interestingly, we noted Spain was a link exposed by The Guardian in their investigations into the scandal. Interestingly, just as I am writing this article, World Horse Welfare have announced that thousands of horses are being exported from Britain, including many bound for slaughterhouses, with no health or legal paperwork. The charity monitored the port at Dover over a 48 hour period - no checks were made by the authorities and lorries were followed going to markets in Holland, Belgium and France that are used by meat buyers. According to Defra’s records no horses or ponies were exported for slaughter through Dover last year. A spokesman for AHVLA said the UK has to respect laws governing the movement of animals across Europe and “unless there are good grounds, it prohibits routine checks at ports which would undermine the principles of free movement”. (Article published in The Sunday Telegraph February 2014). Unless all these laws and regulations are enforced...and the loopholes are closed, they mean nothing, and it’s the ponies that suffer as a consequence. You can’t help but wonder why we are allowing live exports for slaughter at all...let’s hope we can get some action from Defra to ensure we have seen an end to the unscrupulous live exports of wild ponies from Britain. Could the minimum value legislation be extended to close the loophole through Northern Ireland? This would make sure that legislation truly does protect ponies from being exploited in the way they have been. 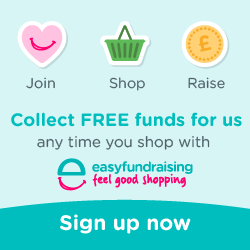 Help Spread The Word About Our Campaign - We need to spread word of our campaign. Add a link for our website to your social networking. Write to your local MP! Ask if they will support our calls for Defra to ensure an end to the export of wild ponies from Britain and to ensure that the loophole in the Minimum Value legislation is closed. Donate to help us continue our investigations, and to continue campaigning to get this issue raised in Parliament.